One of the most lush, immersive, gorgeous movies I've seen in a very long time. I sat enraptured and riveted the second it began. If Kurt Russell's Breakdown, Nicolas Winding Refn's/Ryan Gosling's Drive, Jake Gyllenhaal's Nightcrawler, Kevin Bacon's/Meryl Streep's The River Wild, Ang Lee's Life of Pi, and Alfred Hitchcock all had one baby, it'd somehow grow up to be Nocturnal Animals. Though, frankly, even THAT doesn't quite do the film justice, as it has a fourth dimension—style and gloss and aesthetic beauty—that is virtually unmatched and incomparable to anything on the cinematic landscape today. At once the film is art, and then it is the most menacing, disturbing, raw, simple, and creepy 'worst nightmare scenario' one can imagine. Michael Shannon is—as always—a quietly dynamic, magnetic orb of pulsating energy from which you cannot divert your eyes. I just love this guy; he NEVER lets me down. Amy Adams, Jake Gyllenhaal, [relative English newcomer] Aaron Taylor-Johnson, Isla Fisher, Armie Hammer (! ), Laura Linney, and Michael Sheen round out a stellar cast, in roles large and small and ever-delicious. 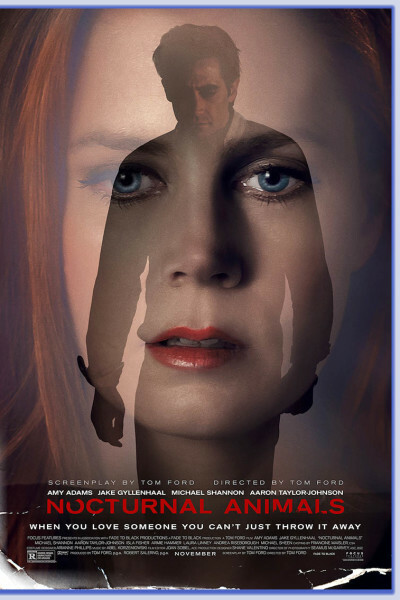 The heart and soul of Nocturnal Animals is vengeance, and it arrives in the most thrilling, surprising, delightfully unsettling ways, some passive-aggressive, and some as direct as your forehead-lighted ophthalmologist barrelling toward you whilst strapped to the grill of a howling, thunderous, murderous train. From moment zero, you won't be able to take your eyes off it, but you *may* wish you could. It's tantalizing, alluring, repulsive, repellent, repugnant, and spectacularly captivating and effective. I would like to say that I shall see it again, to lap it up once more. But that would be the equivalent of revisiting Full Metal Jacket or Hurt Locker for the fun of it. Amazing films, to be sure, but hardly the sort one wishes to imbibe more than once. If you're paying attention, Nocturnal Animals is emotional seppuku. If, on the other hand, you relish such fare, then you should run—not walk—and getcha some of what Ford's peddling, 'cause Tom is bringin' the simmered heat in a film that may initially seem 100% bizarre and vacuous and hollow, and yet which ultimately fills your gills with tragic beauty, curiosity, wonder, satisfaction, and a lingering what the heck just happened here? hangover. It's a gorgeous, seductive, sleek, slick visual mess in every conceivable, desirable way. Sadly, being an 'art-house' production, it will fade faster than summer's lightning bugs. Here's hoping the animals find an appreciative audience in their digital afterlife.